GUATEMALA CITY, Jun 10 2011 (IPS) - Guatemala will become a hub of connection and logistics for world trade when a highway-rail cargo transport corridor linking the Atlantic and Pacific oceans is completed. “The idea emerged in 1998 when a group of Guatemalan business leaders saw that global container transport would run into a potential obstacle in the Americas, due to the limitations of the Panama Canal,” Rokael Cardona, president of the private Power for All Association (PPT), one of the partners involved in the project, told IPS. The tender for construction of the 372-km-long and 100-metre-wide interoceanic corridor will be held in July. The project will include a nearly straight four-lane highway and a parallel freight rail line, oil pipeline and gas pipeline. The Panama Canal, which has been operating since 1914, will soon reach its maximum capacity, due to the increase in global trade. According to studies by the PPT, this and the fact that land routes in the United States are also overwhelmed by freight traffic will generate a potential market for the interoceanic transport of nine million containers by 2020, even if the existing routes are upgraded. This represents an opportunity for Guatemala’s interoceanic corridor, which would begin to operate that year, as part of a 12 billion dollar megaproject that will also involve the construction of two ports for ships with a cargo capacity of more than 8,000 containers, as well as several industrial parks. For example, the need for interoceanic transport will increase between South Asia and the eastern seaboard of the United States, two parts of the world that account for a large proportion of international trade. The limitations of the Panama Canal include the system of locks, which is unable to handle vessels of cargo capacity of more than 15,000 TEU (“twenty-foot equivalent unit” which represents the cargo capacity of a standard 20-foot-long, 8-foot-wide container). Guatemala’s location is a plus. “The distance from the Pacific to the Atlantic oceans is relatively short, 372 km along the route to be followed by the project, while in Canada the distance is 7,000 km and in the United States it is 5,000 km,” Cardona explained. The route will run through 17 municipalities in five departments (provinces) along the eastern border of Guatemala: Izabal, Zacapa, Chiquimula, Jalapa and Jutiapa. The departments border El Salvador and Honduras, with the exception of Jalapa. “We will publish the feasibility study in late June, and in July we will begin the tender process, to start building in 2012,” Cardona said. The project will be broken up into different concessions, he explained. The initiative is based on a strategic alliance with the Port of Barcelona, in Spain, and is promoted by the Guatemalan company Oficina de Enlace y Negocios para América Latina, accompanied by 14 other partners with shareholders in Chile, El Salvador, Guatemala, Japan, Spain, the UK and the U.S. The promoters of the project say it will bring numerous economic and social benefits to this Central American country of 14 million people, half of whom live below the poverty line and 17 percent in extreme poverty, according to United Nations statistics. “This will be the most important foreign investment in Guatemala, which will generate 350,000 direct jobs as well as taxes for the central and municipal governments once it begins operating,” Cardona said. A projected 25,000 people will be employed in the construction phase. One unique aspect of the mega investment project is the public-private alliance that the investors have forged with the 46 municipalities through which the route will run, which have organised themselves in nine associations that will be shareholders in the corridor. “The project has managed to put on the table the philosophy of a public-private partnership, but not in the classic style between central state and private sector. This was created on the basis of municipal autonomy, so the local communities will see the project as their own,” explained Cardona, whose organisation promotes decentralisation. On Aug. 4, 2009, the business leaders and 46 mayors of the municipalities in question signed an alliance to jointly push forward with the corridor. “In material terms, there will be more prosperity, because there are many unmet needs here,” in the areas of health, education and work, added Rivera, who lives in one of the municipalities hit hardest by the severe food crisis that has plagued the country in the last few years. The interoceanic route, which will stretch from the Pacific coast city of Moyuta in the southeast department of Jutiapa northwards to the Atlantic port of Puerto Barrios, in the northeast department of Izabal, will run through part of what is known as the country’s “dry corridor” – an arid region in the northeast and centre of the country characterised by lack of rainfall and high poverty levels. Each year, this combination of factors cuts short the lives of dozens of victims of child malnutrition in this country, which has the highest malnutrition rates in Latin America. But not all local residents in the area through which the highway, railway and pipelines will run believe the project will help improve their living conditions. On Oct. 12, 2010, enraged local residents set fire to the city government building in Jocotán and the local market, to protest construction of the route, mining industry activity in the area, and the construction of hydropower dams. The uprising became the first social conflict triggered by the project, and forced the designers to modify the route, which will now go through neighbouring municipalities instead. Julio González, an activist with the local environmental group Madreselva, told IPS that if the views of the local population are not taken into account, further unrest could break out. In addition, González called attention to the fact that the route designed for the highway-rail corridor coincides with gold and silver mining projects, such as the Cerro Blanco and El Oasis mines, operated by the Canadian companies Goldcorp and Tahoe Resources, respectively. 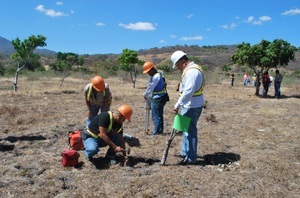 The former is located in Jutiapa and the latter in the adjacent department of Santa Rosa. By contrast, Adolfo Vásquez, manager of the Copan Chortí association, told IPS that his organisation backs the project because it will generate social development. The association groups four Maya Chortí indigenous municipalities in Chiquimula. “When the project is completed, the nine partner associations will receive 14 percent of the local profits. These funds will go into projects with a major social impact, in education, health, food security and the environment,” he said. “Now we are measuring the land, and a few agreements have to be reached, but everything else is ready,” he said.